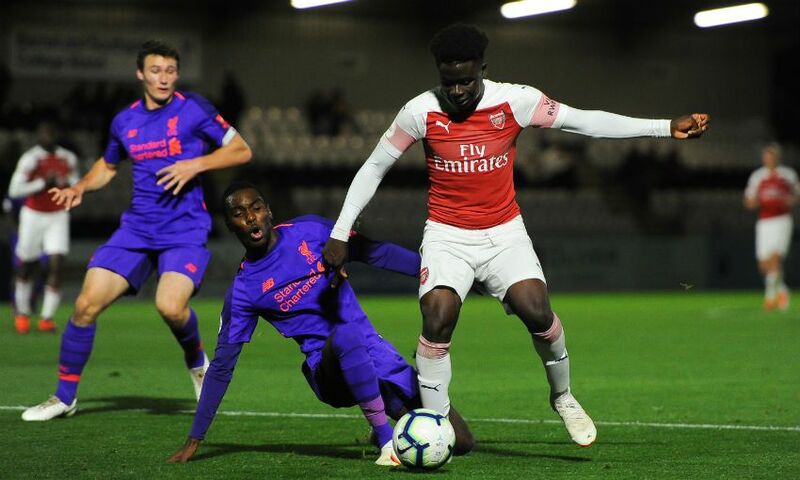 It was a frustrating night for Liverpool U23s as they lost 4-0 to Arsenal in Premier League 2 at Boreham Wood FC on Friday. Two goals in each half made sure Freddie Ljungberg's team took the three points, although the young Reds did create their share of good opportunities. Neil Critchley's team started brightly and on 10 minutes Bobby Adekanye found himself with a clear run on goal before he was brought down just outside the box. Adam Lewis stepped up to take the free-kick and was unfortunate to see his effort drift just wide. A superb pass from Matty Virtue then released Rafael Camacho into space down the right, and after the 18-year-old cut inside his marker his curled attempt was saved by Deyan Iliev. However, two goals in the space of three first half minutes swung the game in Arsenal's favour. With 21 played, Eddie Nketiah held off Nat Phillips and sent Bukayo Saka racing through the middle. The winger beat Kamil Grabara with an excellent finish into the bottom corner of the net. It became 2-0 moments later and the young Reds only had themselves to blame. After trying to overplay in their own penalty area, a loose ball fell to Nketiah who netted from close range. Critchley's charges had a good chance to get back in the game on 34 minutes when a pinpoint delivery from the left side by Lewis found Lazar Markovic, but his close-range header sailed the wrong side of the post. Before the interval, Grabara showed his quality at the other end of the field with a brilliant stop to deny Tyreece John-Jules. Liverpool side came out for the second 45 minutes with a real purpose and continued to carve out some good openings. Markovic saw a goal-bound header superbly pushed over the bar by Iliev, and Adekanye fired an effort just wide after a surging run. The Dutch youth international was also unfortunate to see a follow-up attempt cleared off the line after Iliev initially denied Virtue. The Reds had a great chance to get themselves back into the game 15 minutes from time when a superb low cross from Lewis found the unmarked Markovic at the far post, but he couldn't provide the finish as Iliev blocked the effort. And three minutes later it became 3-0 when Joe Willock drove through the Liverpool defence to slot the ball beyond the reach of Grabara. There was further concern for Critchley when Adekanye had to be stretchered off the field after a heavy fall following a foul and the Reds ended the game with 10 men. In stoppage-time, Nketiah turned smartly in the penalty area to net his second goal of the game to make it 4-0. Liverpool U23s: Grabara, Camacho, Lewis, Phillips, Johnston, Chirivella, Adekanye, Virtue, Markovic (McAuley, 78). Christie-Davies (Coyle, 72), Millar (Gallacher, 45). Subs not used: McKenzie-Lyle, Tagseth.